The scene at last year's Uncharted show, mixing artists from various disciplines. As it enters its third year, the multidisciplinary arts event Uncharted is moving in two different directions. One of those trajectories is toward greater accessibility. After launching in 2015 with Handel's Water Music as its musical framework, Uncharted adopted Prokofiev's self-described "symphonic fairy tale" Peter and the Wolf for its second outing last year. Neither of those works would qualify as obscure, but few are as widely recognized as this year's framework, The Four Seasons (ca. 1721) by Antonio Vivaldi. Thanks to an ubiquity that extends from call-hold Muzak to TV commercials, Vivaldi's four-part cycle of violin concerti has almost become the archetypal sound of classical music. And it has commercial cachet to boot. Even conservative estimates put the number of recordings of this work in the hundreds — and that's just since its first modern recording in 1942. 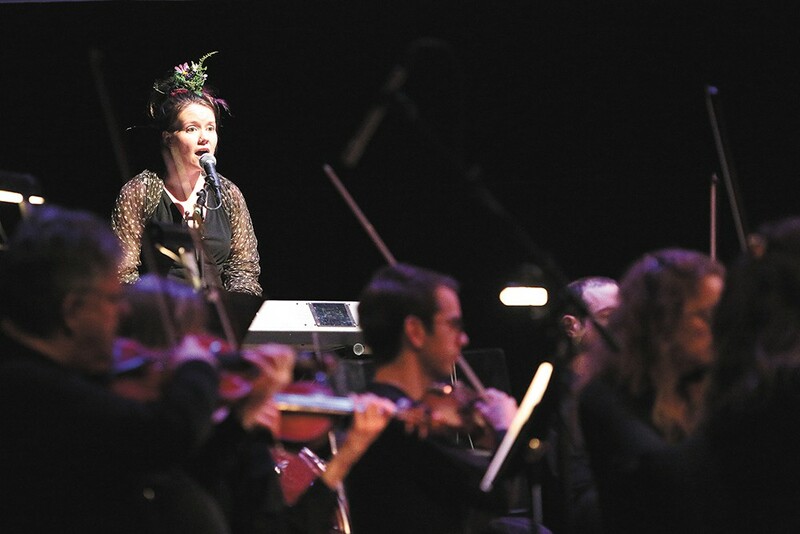 Among that unusually large archive, violinist Nigel Kennedy's 1989 recording of The Four Seasons entered the Guinness Book of Records as the best-selling classical recording in history. Uncharted is also now expanding from one night to two, opening the possibility for more audience members to experience the event. At the same time as it broadens its appeal, however, this joint initiative of the Spokane Symphony and the nonprofit arts group Terrain is becoming more ambitious. Through the continued involvement of musicians, dramaturges, writers, conceptual artists, designers, dancers and — for the first time — an aerialist, Uncharted is introducing additional layers into a "programmatic" work that has been augmented by textual and extramusical elements for centuries. Elissa Ball is one of three participating writers this year. While author and columnist Shawn Vestal will read throughout the performance from an original story that, as Ball explains, functions as an "overarching narrative" to The Four Seasons ("We were joking that he's the Burl Ives narrator in the Rudolph the Red-Nosed Reindeer special," she says), Ball and Mark Anderson have composed poems that are specific to different movements. In Ball's case, it's the third movement from the "Autumn" concerto. The movement is a bright, rather dainty minuet, and its original accompanying poem begins: "The hunters emerge at the new dawn / And with horns and dogs and guns depart upon their hunting." "I've been vegan since I was 15. I'm not a hunter," Ball laughs. "So I went a different route. Originally, I was going to write about the tension when you desire someone and they don't desire you. And then in February, I read this headline that a gay couple had been attacked in Missoula outside a bar, and it really struck me. So I thought, no, forget about everything else — this is the interpretation of hunting, or being hunted, that I'm going to bring to the project." Because of Uncharted's fluid and collaborative development process, Ball says she was also able to shift in response to contributions like Vestal's, which took "a more political approach" than a straightforward rendering of the musical and poetic motifs in Vivaldi's work. It was similar for the bluegrass/Americana fiddler Jenny Anne Mannan, who says that The Four Seasons offers a great deal of "backstory and texture" on which to draw, but each artist has channeled that in different ways. She was assigned the first movement of the "Autumn" concerto, which Vivaldi meant to evoke a "harvest party celebration." "I have four kids, and we end up going to a lot of weddings in the summer, and there's this very common thing that happens in the car on the way home, where the kids are elated from the party and they're still thinking about some of the songs they might have danced to. And then as the car ride progresses, they get sleepy, but the music is still dancing in their heads," she says. The song she composed reflects the "jubilant" and "sleepy" quality of that particular mood and, by extension, the season. "It almost feels a little bit like a hymn to me," she says. Backed by the 15-piece orchestra, Mannan will play guitar and sing after performing a kind of instrumental duet with Spokane Symphony concertmaster and violinist Mateusz Wolski. Karli Ingersoll of Windoe, whose own piece will be performed as part of the Autumn concerto's second movement, will provide backing vocals, along with gospel-folk musician Caroline Fowler. Closing out The Four Seasons' year is John Hernandez, an accomplished aerialist who recently moved back to Spokane after performing with Night Flight Aerial and Circus Arts in Portland for more than a decade. "At first, I was assigned to a piece in 'Summer' — the 'gnats and flies,'" he says, referring to the brief second movement of the second concerto. "One, the music was too short for an aerial piece, and two, it was so extreme, with being really quiet at some points, then just really frantic at other points. It didn't really lend itself to moving around in the air." Hernandez much preferred the "snowfall" imagery elicited by the final movement of "Winter." Costumed in white, he'll use his performance to convey "the idea of being an individual snowflake out of many, just having this experience of being blown around in the wind and seeing where it takes him." Although some of the participating artists have chosen to deviate from a more traditional approach to Vivaldi's music, Hernandez says his aerial routine was instead adapted to suit it. "Really, the only thing the symphony and I had to talk about was adding maybe 10 or 15 extra seconds. I didn't want to change anything if I didn't have to." Paradoxically, it's self-imposed constraints like those that have allowed Uncharted's artists to grow and experiment more freely over the past three years.